What is UK Airport Parking? There are 3 types of UK Airport Parking to choose from. You park your car in a car park near to the airport and hop in a shuttle bus to the airport. 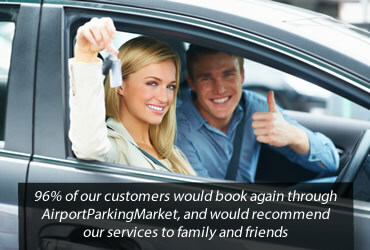 All car parks on AirportParkingMarket are pre-checked to ensure that the sites are suitably safe and secure and that your car is going to be properly looked after while you’re on holiday. Simply drive to the airport terminal and your car will be looked after by a fully insured chauffeur who will take it to a secure parking facility near the airport. Most services ask you to give them a call before you arrive at the terminal to let them know you’re on your way. When you arrive back in the country give them another call and they’ll bring your car to the airport. These services are usually the option that is closest to the airport and are often run by the airports. More often that not you don’t even need to take a shuttle bus to the airport as the car parks are so close to airport.